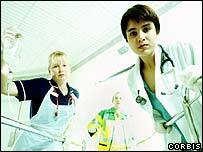 BBC NEWS | Health | Are health tourists draining the NHS? Are health tourists draining the NHS? Can we see your passport, please? The government has announced plans to clamp down on so-called "health tourists". BBC News Online examines claims that they are a serious drain on the NHS. Nobody knows how many "health tourists" come to the UK each year solely to get free treatment on the NHS. As a result, the true cost to the health service and British taxpayers is unknown. However, ministers believe the problem is big enough to warrant a clamp down. They have introduced new rules to stop overseas visitors and failed asylum seekers from getting free treatment in hospitals. They have now announced plans to take similar steps to prevent them from being treated by GPs for free. But is it really a big problem? Health Minister John Hutton has conceded that the government does not know how many people come to the UK to get free treatment on the NHS. "I can't give you a figure for that. No one can," he told the BBC recently. "That is something we need to address." There have been no substantive studies into this issue. Figures from CCI legal services, a debt collection service, put the cost at anything between £50m and £200m each year. A leaked report from Newham General Hospital in East London suggested health tourists cost the trust £1m a year. However, a subsequent study has found that the true figure may be much lower. "Over the last three months, the number of patients identified as ineligible is 17," says Ian O'Connor, its director of finance. "The cost of this treatment over that period is £32,000." With an annual budget of £100m, this figure is practically negligible. However, Mr Hutton insists that health tourism is a problem and that action is needed. "There is absolutely no doubt in my mind and I think in the mind of any other person who has dealings on this subject in the NHS that there is a significant amount of abuse going on," he says. Pauline Lewis, a manager at a major hospital in South London, backs up those claims. "It's a big problem," she says. "If you speak to the overseas managers throughout this country everyone will give you horror stories. "Everyone will say they are seeing numerous patients every week. In the trust I work for, we saw 1,400 patients last year." Gill Morgan of the NHS Confederation, which represents NHS management, shares that view. "There are pockets of places where the extra burden on the services has been quite significant," she says. An investigation by the BBC's Real Story team, aired in August, also uncovered anecdotal evidence of abuse. It included secret-filming of people in Nigeria who have British GPs and travel to the UK to use the NHS. However, many experts question whether the problem is as big as the government claims. Dr Edwin Borman of the British Medical Association says there has not been any definitive research showing health tourism was a significant problem. "Certain ministers seem to want to highlight this issue from time to time, usually when there is another story that they don't want to hit the news," he says. Arrangements already exist for costs to be recouped when EU nationals have treatment in British hospitals, and these could be extended to cover other countries, he says. "We would prefer the government to explore those avenues, rather than jumping on a bandwagon." Professor Alan Maynard, a health economist at York University, also questions the government's claims. "I think the department itself is creating the headlines," he says. Professor Maynard believes ministers should ask themselves if the policy is worthwhile. "What we need is much better data and evaluation of whether it is worthwhile going to extraordinary lengths to pursue marginal amounts of money. "To spend a lot of money pursuing a relatively small amount of money would be unwise and we really have to look very carefully and evaluate this policy much more carefully than has been done to date." That view is shared by Dr Heaven Crawley, associate director of the Institute of Public Policy Research and a former civil servant at the home office. "Even if the scale of the problem of health tourism is of the magnitude that the government suggests - perhaps hundreds of millions - that is actually a very small proportion of the overall cost of the health service. "And even if you were to get rid of that particular problem it wouldn't solve the problems of waiting times or shortages in particular areas." Margaret Lally, deputy chief executive of the Refugee Council, has accused ministers of acting irresponsibly over the issue. "We think it is dangerous and irresponsible nonsense. "The government is using figures which are inaccurate and have been poorly thought through. "It may result in asylum seekers being denied the healthcare they need and also demonising them in the eyes of the public and also in the health community."